One of the greatest things I learned while working in a Private Dining room in NYC was how to make Roasted Tomatoes. 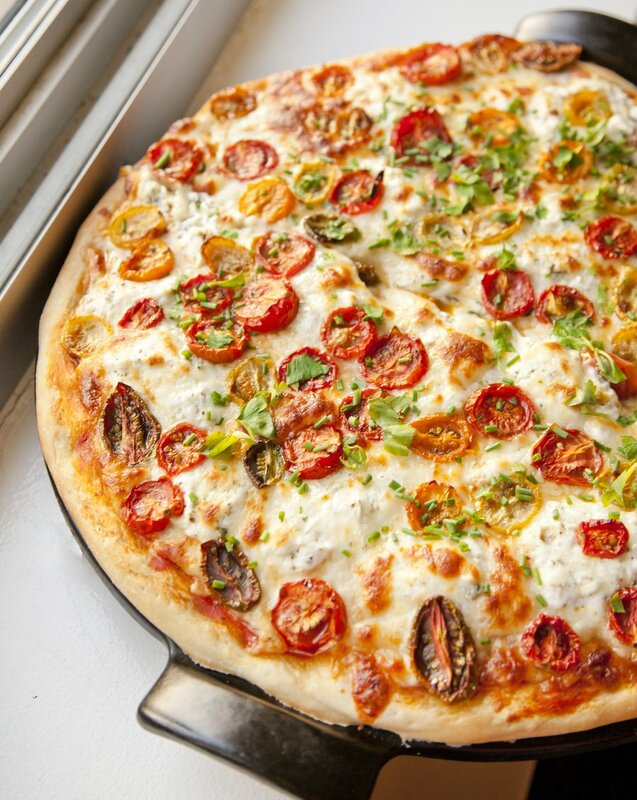 Usually made with grape tomatoes (or any small tomato), I have been making mine with Mini Heirloom Tomatoes now that they’re in season. They’re so simple to make, and really transform the taste of a tomato into the most incredibly delectable little morsel. With just a few ingredients (Olive Oil, salt, sugar and fresh thyme), these roasted tomatoes are great on pizza, bruschetta, focaccia, in an omelet…. So for this pizza I did a combo of a little bit of tomato sauce (you can buy canned – ugh – or try my recipe below! 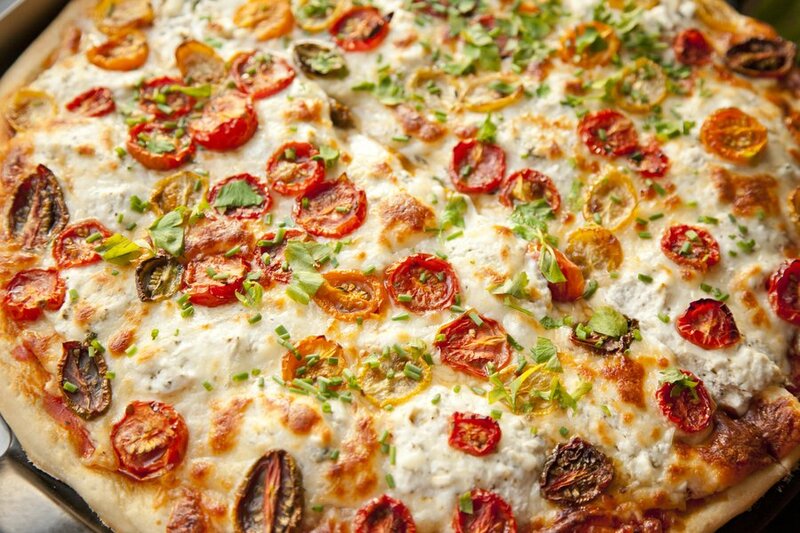 ), ricotta cheese, Parmesan, mozzarella and these yummy roasted heirlooms. 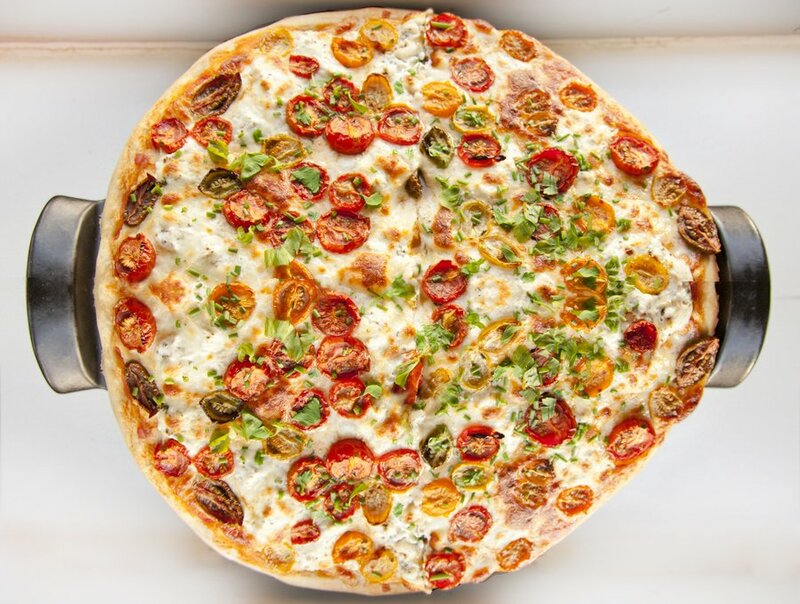 The pizza tastes like one of those artisanal pizzas you can get at a restaurant for a small fortune, and this can be served for a family dinner, or cut up into smaller pieces for an appetizer at your next party! To make the Roasted Heirloom Mini Tomatoes: Preheat your oven to 325 degrees. Cut your tomatoes in half lengthwise with a serrated knife. Place the tomatoes flesh side up on a baking sheet lined with a silpat. Drizzle liberally with Olive Oil. Sprinkle with Salt, a little bit of Sugar and top with a few sprigs of thyme. Bake in the oven for an hour. Remove from oven. For the Pizza: Preheat your oven to 425 degrees. In a small bowl combine your ricotta, parmesan, oregano and basil - mix together. 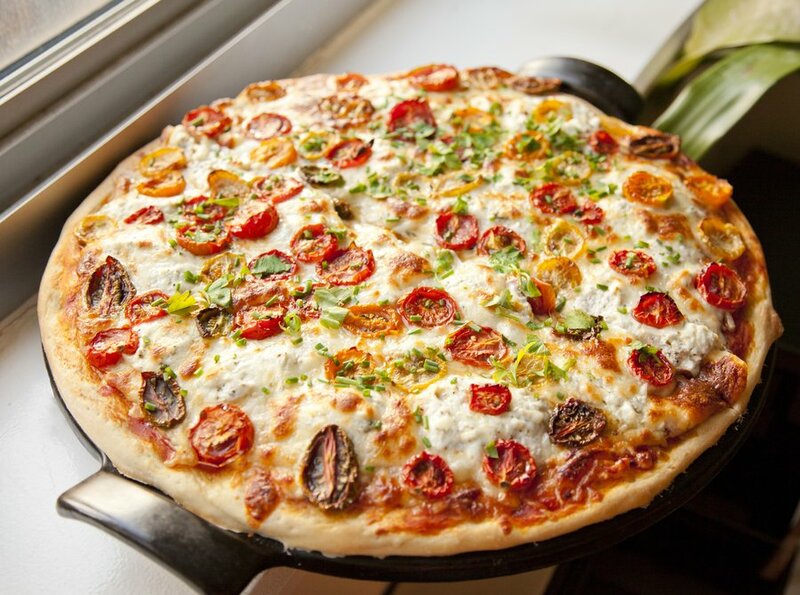 Stretch out your pizza dough to fit a 16" pizza stone (or just do on a baking sheet sprayed with non-stick spray). 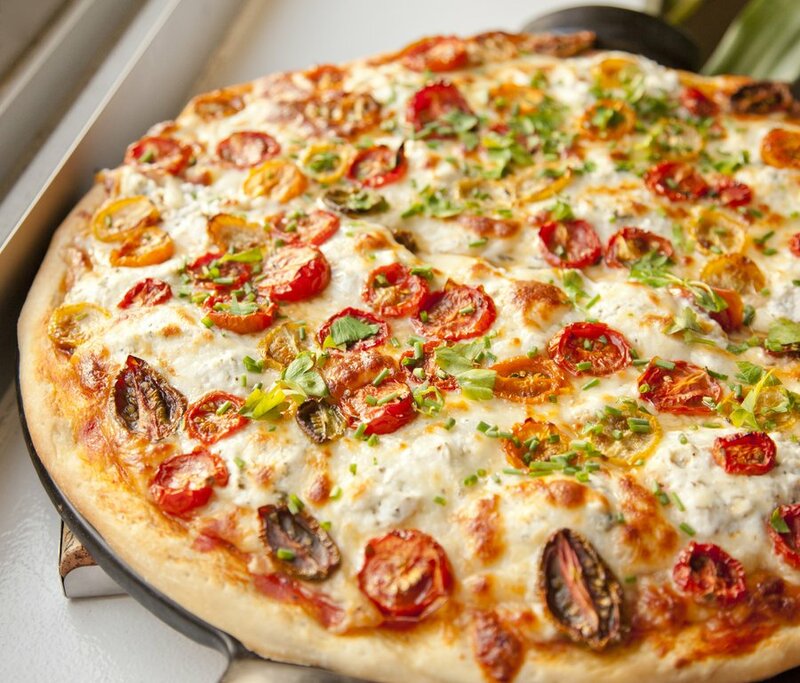 Ladle out your tomato sauce evenly around the pizza dough, leaving a 1/2" border around the edges. Spoon out small dollops of your ricotta mixture around the dough. 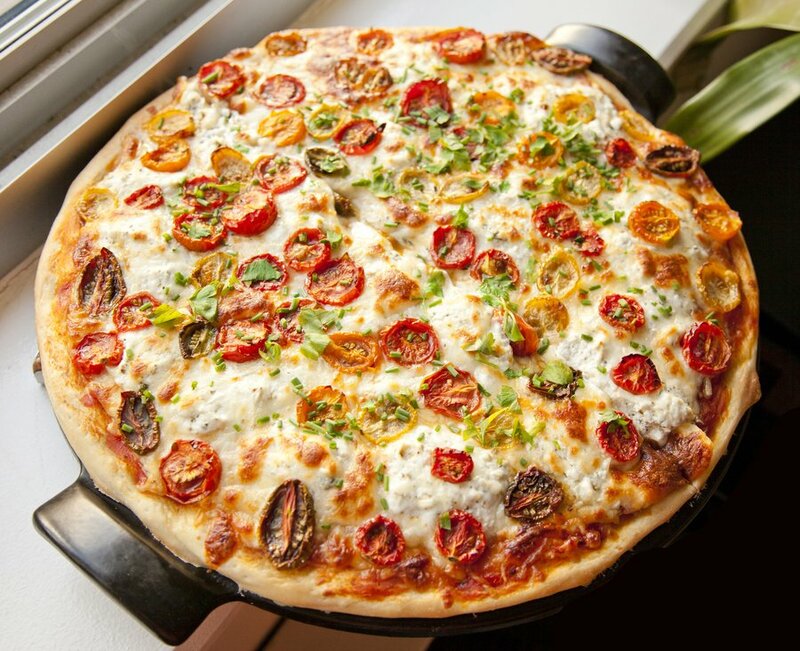 Top with an even layer of mozzarella and then place your heirloom tomatoes on top. Bake for 20 minutes. Then switch your oven to HI Broil and bake another 3-5 minutes or until the cheese starts to lightly brown. Serve immediately. In a large pot, over medium high heat, add your Extra Virgin Olive Oil. Once hot, add in your fennel seeds and crushed red pepper flakes and cook 1 minute. Add in your onion and cook about 5-8 minutes until it starts to turn translucent. Add the garlic and cook another 2 minutes. Now you can add in your whole tomatoes, tomato puree, basil, and crushed bay leaf. Bring to a boil, then reduce to a low heat, cover and let cook about 2 hours. Once it's done, place in a Vitamix or other strong blender and puree til smooth. Taste and season with salt and pepper. Jar for later use or use right away.